SPORT England, the funding body that hands out taxpayers money to sports governing bodies, was kept in the dark over alleged breaches of the UK National Anti-Doping policy, Sportingintelligence can reveal – meaning a governing body is continuing to receive a £28m four-year funding package of public cash that should arguably be under review. As reported previously (with further details today), a positive drugs test by the former GB rugby league star Martin Gleeson at Hull FC last year led to a drugs cover-up that Gleeson alleged involved the Rugby Football League, if only by failure of officials to pass on key details at certain times. A six-month investigation costing a large six-figure sum by UK Anti-Doping (UKAD) considered a serious anti-doping charge against a senior RFL official, for their role in the cover-up, Sportingintelligence can reveal. That charge was not pursued on external legal advice, but the same UKAD investigation found evidence of breaches of the UK anti-doping policy that were not prosecuted at all on the grounds of finite UKAD time and resources. Sport England relies on UKAD to police anti-doping, and unless it hears to the contrary, dishes out public cash on the assumption that governing bodies are abiding by the drugs policy. The RFL’s current four-year funding package from Sport England is worth just under £28m, or £6.89m a year. UKAD’s investigation into the cover-up involved formal interviews with 13 witnesses, including RFL officials who said they knew details on 3 June 2011 of the supply chain that led to Gleeson taking a supplement containing a banned supplement. Crucially, those officials did not pass that information to UKAD immediately, as clause 4.6.2 of the National UK Anti-Doping Policy obliges. But no action has been taken by UKAD against the RFL, and Sport England have confirmed that they were not told details of the investigation as it unfolded, nor that there was any evidence that the RFL or any of its officials had breached the Policy – which must be followed to qualify for public money. Sport England are understood to have discovered details of the full cover-up evidence only last week when contacted by the media. A spokesman says: ‘We take our own responsibilities under the policy very seriously. The policy clearly sets out the separate roles and responsibilities of Sports Councils and those of UK Anti-Doping when it comes to anti-doping. Gleeson was initially the only person prosecuted for his failed test but Hull’s then-CEO James Rule and conditioning coach Ben Cooper were subsequently prosecuted for involvement in the cover-up. The bombshell investigation case file, running to more than 2,700 pages of statements, transcripts, emails, phone records and other material about the case, was handed by UKAD to Gleeson last month in return for his ‘substantial assistance’ in uncovering the truth. A UKAD official who worked on Gleeson’s case is understood to have told one of Gleeson’s advisors that ‘the gloves are now off’ in the fight for Gleeson to partially clear his name and not stand alone as tainted player in this case. That file given to Gleeson contains evidence that the RFL’s head of anti-doping, Emma Rosewarne – and her immediate boss, the RFL’s C.O.O Ralph Rimmer – both knew on the day Gleeson’s positive result became known (Friday 3 June) that Gleeson had not bought a supplement containing a ‘controlled’ stimulant, MHA, himself. Gleeson went to a tribunal on 9 June 2011 with a story saying he had got the drug himself, in person, from a shop. This was a pack of lies and when it became clear, the cover-up was exposed and investigated. 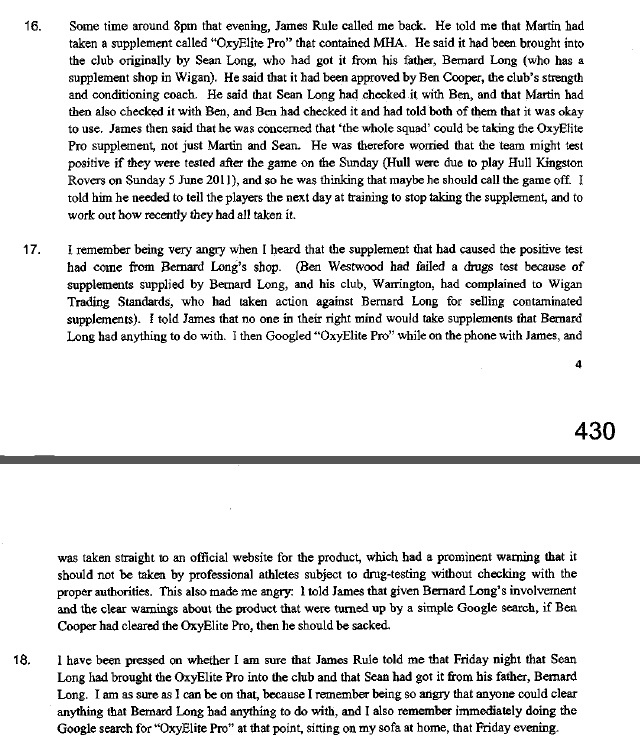 Rosewarne and Rimmer, in their own words and statements (scans below), also told the UKAD investigation that they both knew on 3 June 2011 that Gleeson’s best friend and team-mate Sean Long had been in the supply chain of the supplement (OxyElite Pro) to Gleeson, and both knew that Hull’s CEO, Rule, feared his ‘whole squad’ could have been taking the drug. Crucially, none of that information was passed immediately to UKAD, as the Policy dictates under clause 4.6.2. (A scan of the relevant clause of the policy is in this backgrounder). If that information had been passed on, the cover-up as it transpired could never have happened. As it was, Gleeson was prosecuted alone until he lost his initial case and decided to tell the truth. The RFL has defended its position throughout, insisting in a statement on 15 January (linked here) that it had assisted in the UKAD inquiry and confirming that the RFL had been cleared on external legal advice. Sportingintelligence can reveal the UKAD investigation contains multiple references to the involvement of UKAD’s chief executive, Andy Parkinson, being consulted on the weekend of 3 to 5 June 2011 about a potential appeal by Hull FC (and supported by the RFL) to get Gleeson’s immediate ban suspended so he could play a match that weekend. Despite UKAD being the investigating and prosecuting body for drugs case, the dossier suggests both Parkinson himself and UKAD’s head of legal, Graham Arthur, gave advice to Rosewarne on Gleeson’s suspension appeal. Yet neither Parkinson nor Arthur were formally interviewed for UKAD’s investigation into the cover-up. That initial appeal was somehow successful although legal opinion voiced at Gleeson’s tribunal made reference to a ‘no fault’ plea always being a non-starter. Hugh Robertson, the Minister for sport and the Olympics, is understood to retain confidence in UKAD in Olympic year, but says that governing bodies must share all information they have about doping or suspected doping as ‘a vital part of the weaponry’ in the fight against drugs. ‘We have a first-class testing system in this country but sharing intelligence on doping is also a vital part of the weaponry,’ Robertson says. An anti-doping source stressed that the Gleeson cover-up investigation came down to ‘judgement calls’ and UKAD had to assess whether to pursue the most serious possible charges (which it did) as well as ‘lesser’ charges (4.6.2) that might have affected RFL funding but not led to individuals being punished. Michele Verroken, the former Director of Ethics and Anti-Doping at UK Sport for 20 years and a long-time advocate of independence in anti-doping systems, has told Sportingintelligence: ‘It is essential that anti-doping systems are based on trust and confidence. To achieve this there must be absolute openness and public accountability for decision making. ‘The new era of anti-doping organisations operating nationally carries even greater responsibility to demonstrate fairness, due process and absolute absence of conflicts of interest. ‘Perception of conflicts of interest cannot be allowed to exist, particularly in determining a case to answer or the commission of an anti-doping rule violation. ‘It is unhelpful to our ambition to make sport drug-free that confidence in anti-doping systems can be undermined by such perceptions.